Thanks to all of you on my Facebook page who helped me decide which post went up today. Squash was by far the most voted! My family loves butternut squash. We always grow three or four plants of it in the garden. Along with eating our harvest fresh, like a true pioneer, I preserve as much as I can. 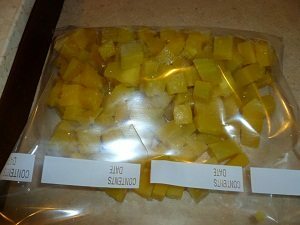 Squash is one of the vegetables you may either store in the garage or root cellar for a few months or it’s an excellent candidate for freezing. 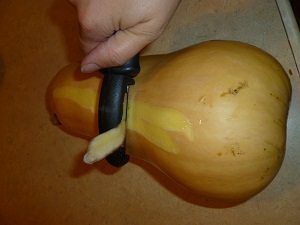 You prepare your squash the same way for freezing or using in my recipe. Peel the skin off using a vegetable peeler. I start from the stem end and chop it into even rounds. Chop it even bite-sized pieces so it cooks uniformly. If you’re going to freeze it you need to steam blanch it. Put an even layer in your steamer and cook it for twenty minutes. 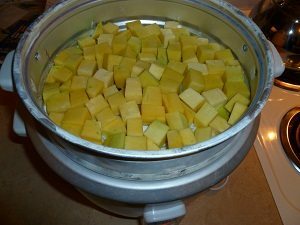 This stops the enzymes from breaking down the squash, destroying flavor, color, texture, and even nutritional value. 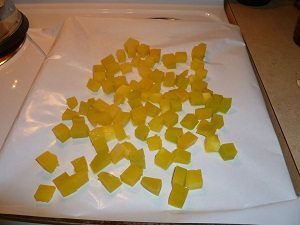 Next, spread out steamed squash on a cookie sheet lined with wax paper. Put it in your deep freezer. Once frozen, transfer to a freezer bag or glass container. Frozen and ready for freezer to enjoy later! 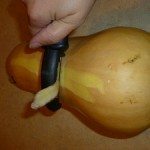 Now for my best ever butternut squash recipe! Place diced squash in pan. Sprinkle seasonings and garlic over top. Drizzle with olive oil and stir to coat. Bake in preheated oven for 35 to 40 minutes, or until squash is soft. Stir once during baking to prevent burning and sticking to the pan. You can grade any kind of hard cheese (Parmesan is great) when done. It’s tasty with or without cheese. Preheat oven to 375 degrees. Place diced squash in pan. Sprinkle seasonings and garlic over top. Drizzle with olive oil and stir to coat. 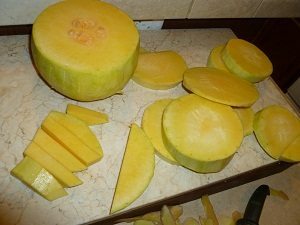 Bake in preheated oven for 35 to 40 minutes, or until squash is soft. Stir once during baking to prevent burning and sticking to the pan. You can grade any kind of hard cheese (Parmesan is great) when done. It’s tasty with or without cheese. 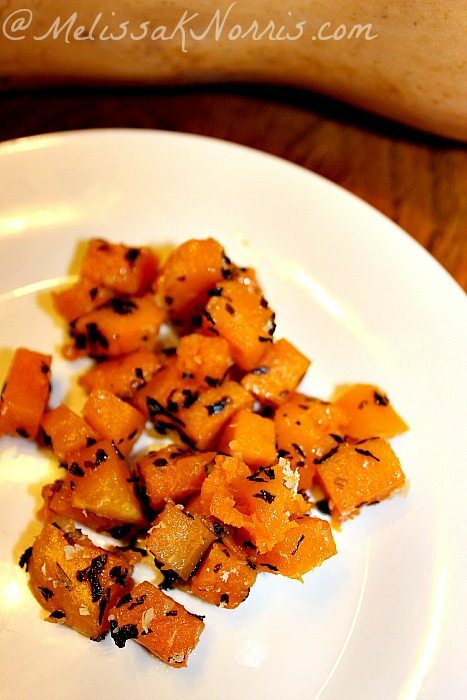 What’s your favorite way to prepare squash? Any tips for storing or preserving? Featured on The Better Mom.